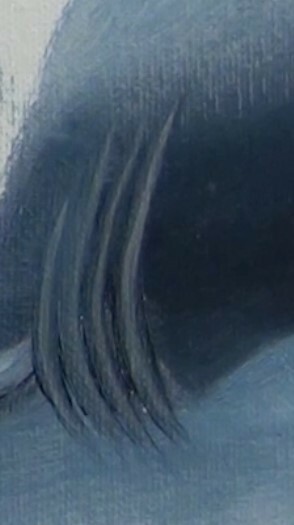 To achieve the varying colours of the water, experiment with French ultramarine blue and gradually add white to it (pulling the blue down in a column and running the white up the column). Blend them lightly with the paint knife to give a tonal-range effect. Do the same with Prussian blue and white; cobalt blue and white; phtalo blue and white; and cerulean blue and white. 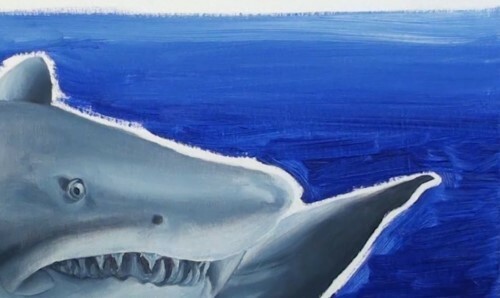 The French ultramarine blue seemed to be the closest match and will be the one used to paint the ocean once the shark is painted. 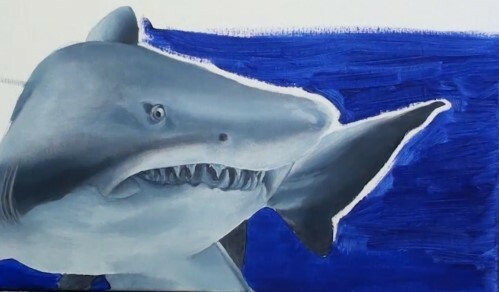 To create the shark's gray colour, start with a mixture of ultramarine blue and a bit of orange to use as the darkest tone. 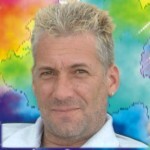 To that mixture, work with some white and a bit of blue to make three other tones, gradually lighter and lighter. 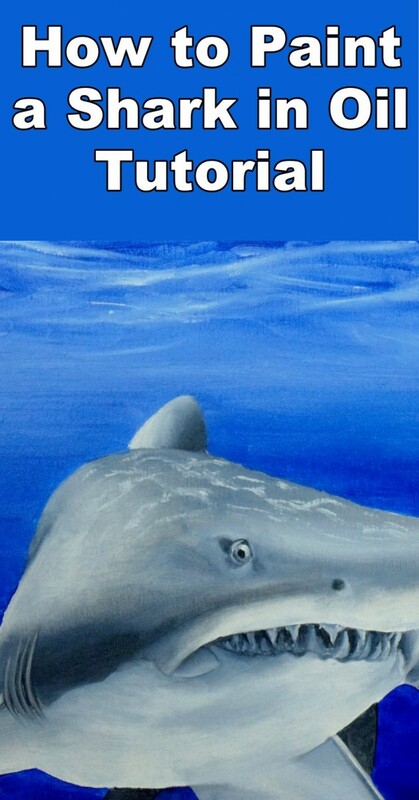 Use your preferred method to transfer the shape of the shark to the canvas. 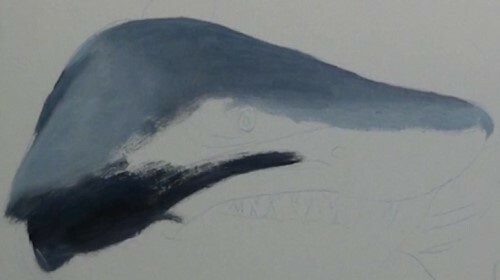 Begin by painting the dark gilled area of the shark and the dark ridge over the mouth. 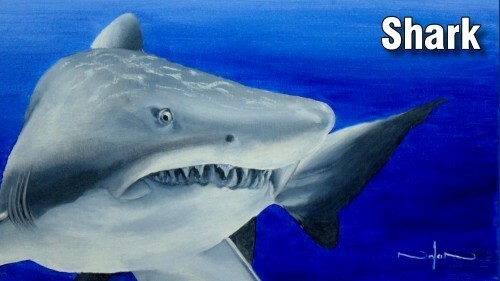 Then paint the next lighter patches and continue on to the lightest area on the top of the shark. Roughly blend them together. Move to the nose area and follow the same technique back to the eye area. Roughly blend that section. Next, begin lightly blocking in the underside, starting with the lightest colour. Add the light patch over the mouth. Follow your reference photo for the correct application of darks and lights at this point. Do rough blendings as needed. Be sure to clean your brush when working with the lights. Use a fine liner brush to paint the nostril and the various tones around it. 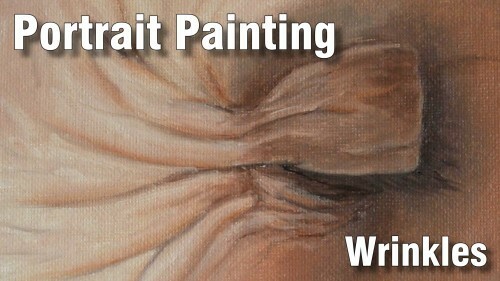 Begin lightly painting the tonal ranges around the mouth and below it. 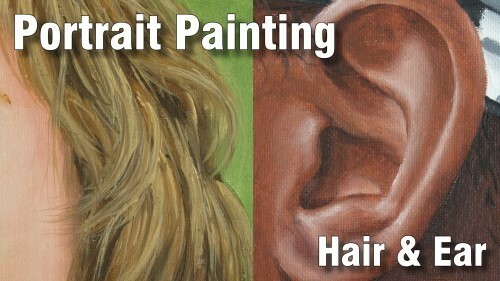 Use the same technique to paint the tones just beyond the eye area. Blend. 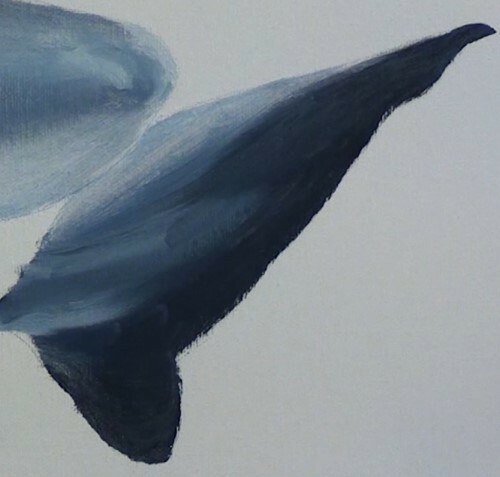 Using a soft filbert brush and the second darkest colour, paint the top of the shark to give the illusion of rounding away to the other side. Blend it in. 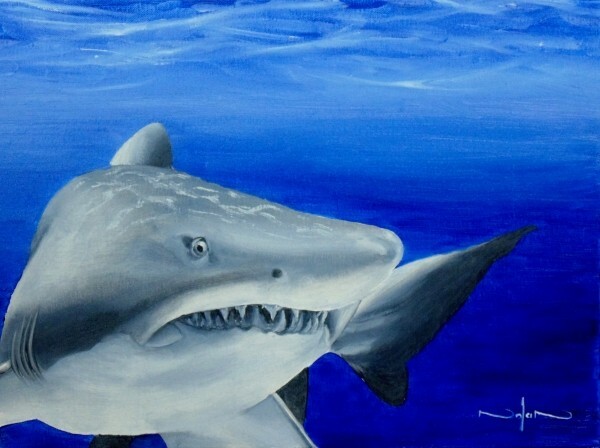 Begin by painting the white spot at the tip of the shark's nose. Keep referring to your reference photo and add bits of paint where needed to correct any areas that are either too light or too dark. Do more precise blendings. Lay down the darkest shade to the left of the eye. Blend the lighter colours around it. Get a small fine liner brush and paint the very oval-shaped center (pupil) of the eye. Work in small semi-circular tonal changes as you move away from the center. Keep checking your reference photo. Dab on some white highlights and add the dark shadows. Continue making highlights next to shadows. 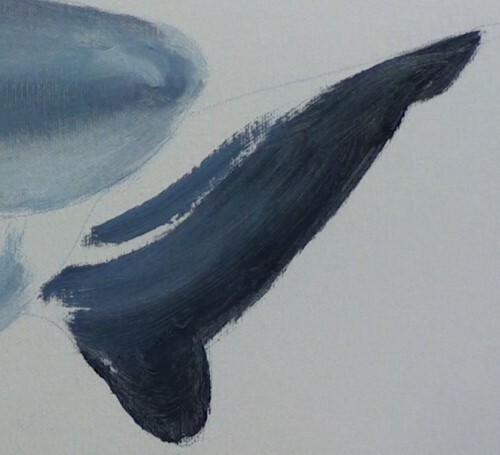 Using a bristle brush, begin painting the dark colour on the right edge of the dorsal fin. Work your way to the lightest colour. 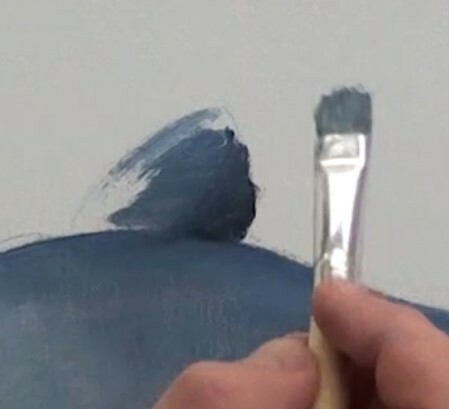 Use a soft filbert brush to do the blending. Finish up the fin with some neat white to create a highlight along the left side. 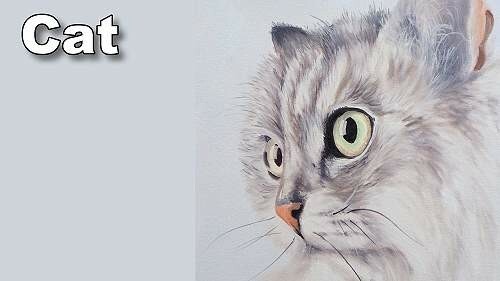 Using the bristle brush, lightly block in the darkest colour and use the lighter shades as you move closer to the body. Go back to the dark shade with a soft filbert or fine liner brush to blend and add the details. 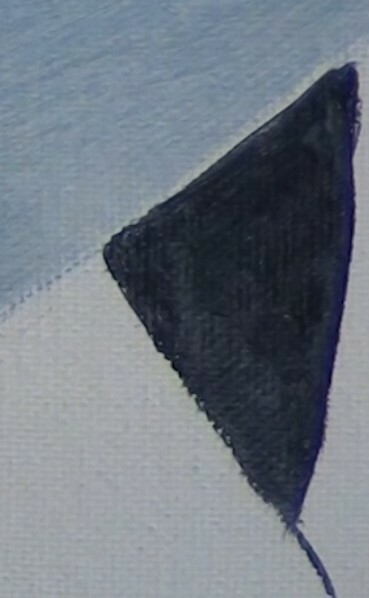 The small triangular section of fin can be done with the same brush, painting it all in with the darkest shade. Do the same for the small fin at the bottom back of the shark. Use your second lightest shade to start painting this fin. Note the technique Nolan uses for creating distance between the fin and the body on the right, then how it attaches to the body in the center. Blend. Add highlights. Block in the darkest colour first. Paint the shape of the gills. Extend the lightest colour under the gills out to the edge of the shark. Blend as you go. Add the darks, clearly defining the gills with a soft filbert brush. Begin by blocking in the darkest shade around the teeth, darker at the top of the mouth where there is less light. Use the second darkest shade for the left bottom side of the mouth, and the second lightest shade on the right side. Alternate lights and darks as needed to finish filling in the right corner of the mouth. Use the same technique to fill in the remainder of the mouth. Add highlights and shadows as needed. Using a soft filbert and your second darkest colour, fill in the area to the left side of the mouth. Add other darks and lights as seen in the reference photo to complete that section. Blend to create a rounding effect. 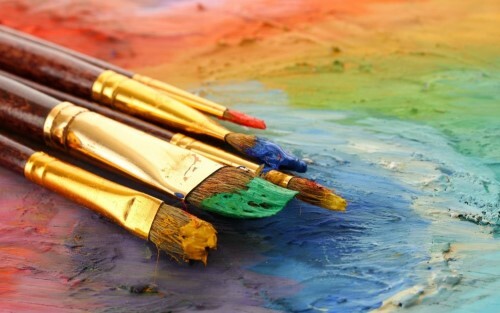 Move the remaining shark colours off to the side of the palette and clean your brushes. 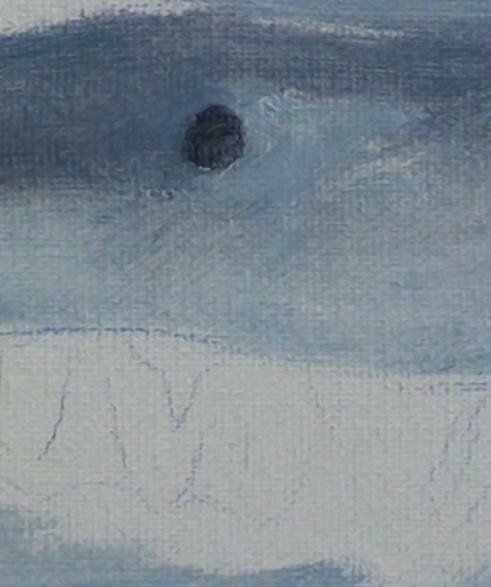 Remember that in painting the ocean, the water will appear lighter at the top and darker as it gets deeper. 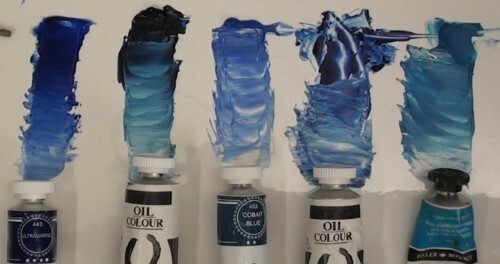 Use ultramarine blue straight out of the tube for the water at the ocean bottom. Add white to create lighter and lighter shades as you come up to the surface. Block in the water, leaving a small gap along the edge of the shark. 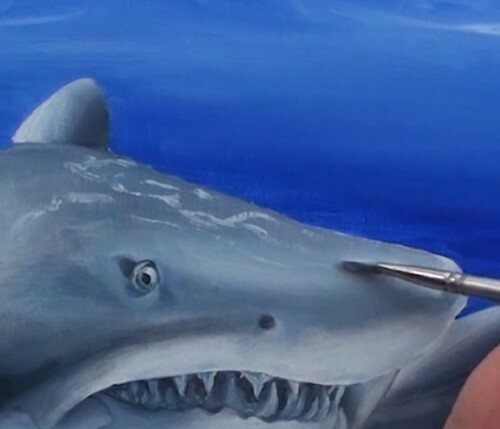 Use a smaller brush to go back and carefully fill in up to the edge of the shark. Then go back and make all brush strokes horizontal. 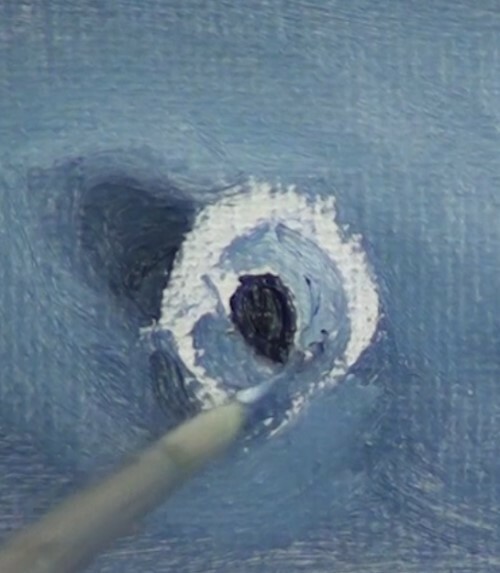 Use the same technique as you did for the small patches on the bottom of the painting to paint most of the remainder of the ocean. 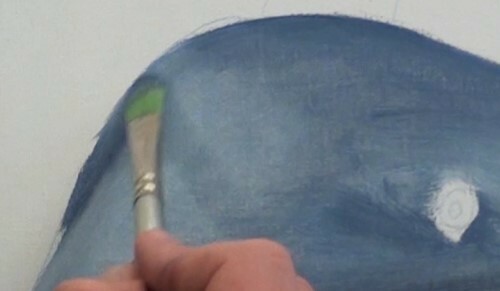 Then add some white paint to the blue already on the brush and paint up to about two inches from the top of the canvas. Blend the lighter area into the darker area with horizontal strokes. 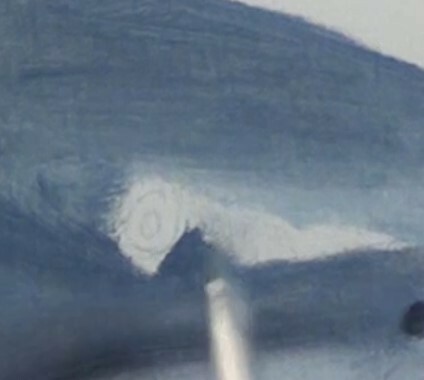 Starting at the bottom, use a soft brush to fill in the water around the edge of the shark. 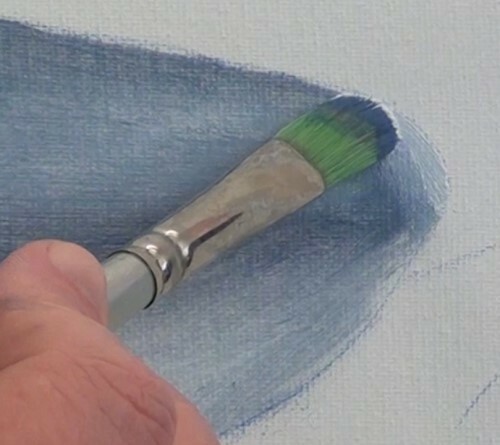 To finish the top of the painting, lay a light coat of ultramarine blue onto the canvas. To create a rippled effect, make random squiggly marks with your brush over the water. Basically, you will be lifting out some of the paint to create movement in the water. Use neat ultramarine to create darker patches. Use your finger or a brush to lift out more patches. Do the same thing again, this time using some white with a bit of ultramarine blue. Blend it as above. 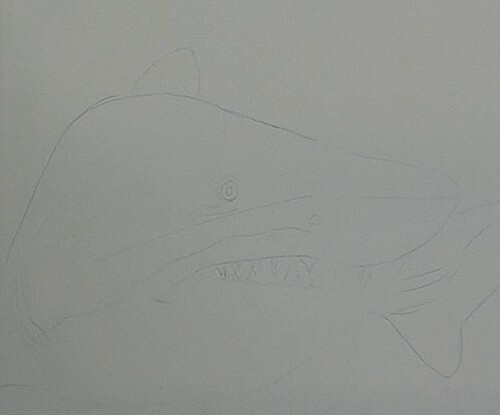 Use a soft brush to make random squiggly lines to create a moving water effect over the shark, following the contour of the shark.